When we first arrived in Moab on Oct 11th, the nice lady at the city’s tourist center suggested that my first trip be to Gemini Bridges. 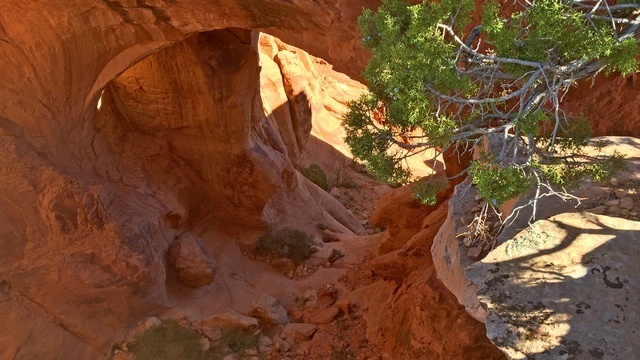 Well, forces conspired such that it was actually on our last full day in Moab, Thursday, 15 Oct 2015, that I had a chance to try the trail. 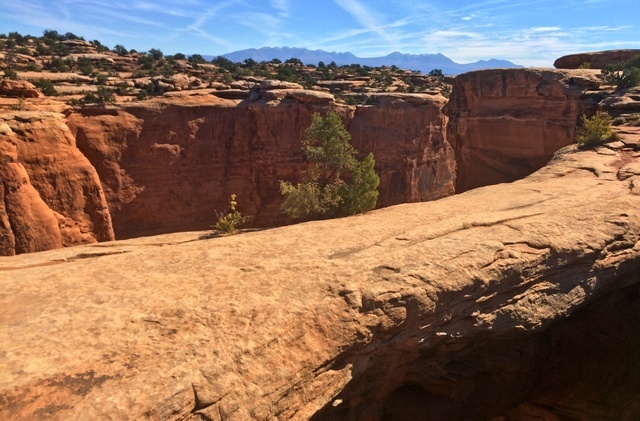 The trail is #10 in ATV Trails Guide, Moab, UT, by Charles Wells. Wells rates the trail as “easy” and he’s right on. There’s a GPS map at the bottom of this post. 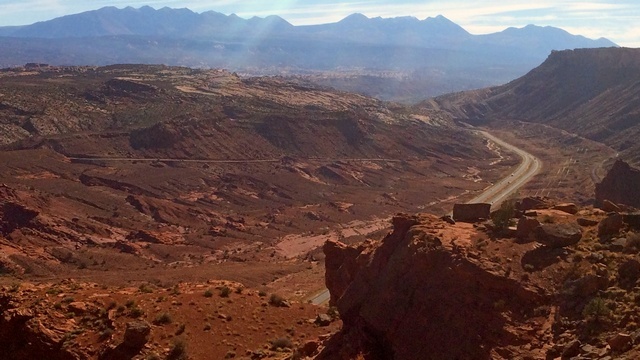 The trail is reached off Highway 191 north of Moab. The parking area is large, unpaved, smooth, and flat. It’s also private, and they ask $5/vehicle. I thought about that for a minute. At least as far as the state is concerned, I actually had two vehicles: the Blazer and the trailer. Anyway, I put $10 in the envelope. I unloaded my Polaris RZR without trouble and followed the signs to the Gemini Bridges (yes, I realize Gemini is a sign of the zodiac, but I’m not intending a pun here). The “trail” is actually a well-graded dirt road traversable by pretty much anything, though I would recommend against passenger cars. Photo 1 below shows the view where the road turns from south to west. The view is looking south toward Moab. The photo was taken from Point 1 on the GPS map. Photo 1. Looking south from Point 1 on the GPS map, toward Moab. You can see the four-lane Hwy 191 in the bottom of the canyon. Photo location: 38 ° 38′ 9.32″ N, 109 ° 40′ 4.36″ W. Photo by Dave Casler. The trail turns west and winds about a bit without any significant elevation gain. Before long you’re at the parking lot for Gemini Bridges, shown as Point 2 on the GPS map. Yes, you have to walk cross country a ways to see them. You need to look carefully to see which way most people go, and follow that track. After a hundred feet or so, you’ll come to where there may well be other people admiring the bridges. 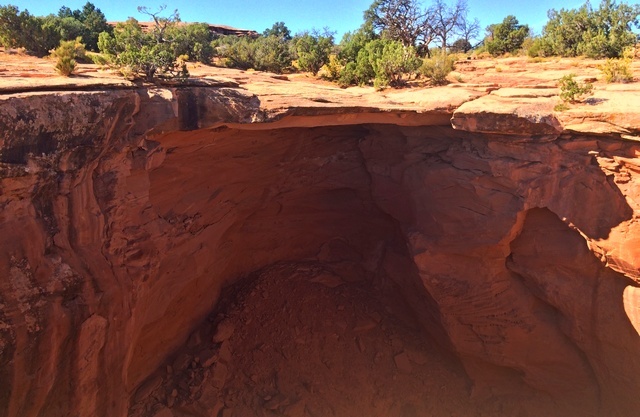 But it was only after looking back that I realized the trail was not only on the edge of the mesa, but that the rocks under the trail have been hollowed out! Photo 2, taken at approximately Point 2 on the GPS map, shows that. And to think I walked straight across that! Photo 2. To get an idea of the scale, note that the bushes on top are about as tall as a person, so this alcove is quite simply huge. And, yes, I walked right across it without knowing I was doing so. Photo location: 38 ° 35′ 9.16″ N, 109 ° 42′ 27.43″ W. Photo by Dave Casler. The Gemini Bridges didn’t live up to expectations, I must admit. After all the grand scenery I’d seen in Moab, they almost seem toy-size by comparison. There are two bridges, right next to each other. The tops are quite flat and are level with the short trail, so, of course, I strolled right out on top of them! Photo 3, taken at approximately Point 2 on the GPS map, shows the top of one of the bridges. Photo 3. The top of one of the Gemini Bridges, taken from the other bridge. I’d say the flat part is maybe 20 feet across. I didn’t feel any fear of heights walking across it. Photo taken at: 38° 35′ 9.65″ N, 109° 42′ 27.54″ W. Photo by Dave Casler. The lighting under the bridges was tricky at best, but Photo 4, taken near map Point 2, shows some. This is the light filtering between and under the bridges. Looking under the Gemini Bridges. The lighting was tricky for my iPhone. Note at the left that a little sunlight comes down from between the bridges. Photo location: 38° 35′ 8.66″ N, 109° 42′ 28.22″ W. Photo by Dave Casler. After the bridges, I motored on, taking the Four Arches Canyon Road. This road heads up a gorge and follows a small power line. The trail becomes rougher as you go, to where “easy” is stretching it. I turned around before it ended, as I didn’t want to be attempting something difficult—and off the beaten track—by myself. Once I got back to the main road, I followed a loop across flat desert and back to the car. Loretta and I had a great time. This trip whet my appetite for more Moab! Here’s the GPS annotated map. GPS track atop a DeLorme Topo North America base map. 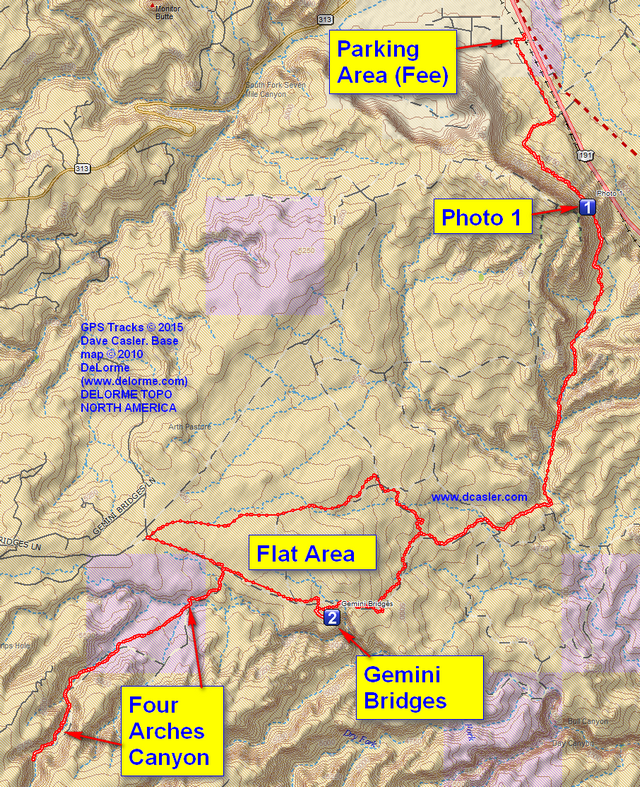 This entry was posted in All-Terrain Vehicles (ATV) and Side-by-Side, GPS Tracks, Utah and tagged Gemini Bridges, Moab. Bookmark the permalink.